For introductory information retrieval courses at the undergraduate and graduate level in computer science, information science and computer engineering departments. 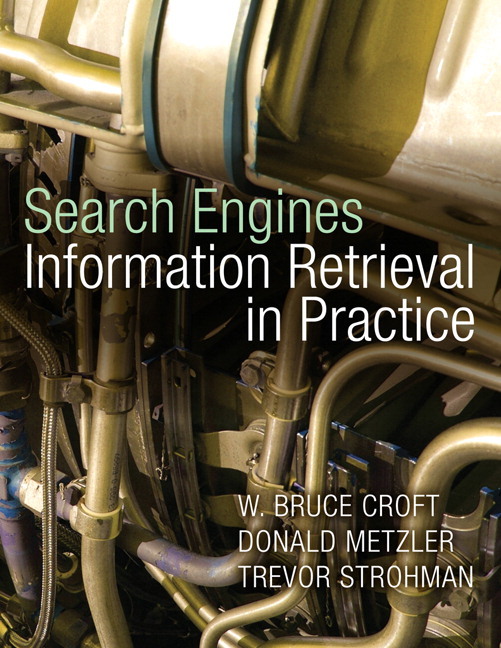 Written by a leader in the field of information retrieval, Search Engines: Information Retrieval in Practice, is designed to give undergraduate students the understanding and tools they need to evaluate, compare and modify search engines. Coverage of the underlying IR and mathematical models reinforce key concepts. The book’s numerous programming exercises make extensive use of Galago, a Java-based open source search engine. Practical treatment of the IR field gives aspiring search engineers the understanding and tools they need to evaluate, compare, and modify search engines. Broad, yet concise, coverage of only the most important issues and techniques in search engines includes the underlying IR and mathematical models to reinforce key concepts. End-of-chapter programming exercises use Galago, a fully functional Java™-based open source search engine that can be used to support real applications. Many of the programming exercises require the use, modification, and extension of Galago components. Instructor supplements include lecture slides (in PDF and PPT format), solutions to select end-of-chapter problems, test collections for exercises, and the Galago search engine. W. Bruce Croft is a Distinguished Professor in the Department of Computer Science at the University of Massachusetts, Amherst, which he joined in 1979. In 1992, he became the Director of the Center for Intelligent Information Retrieval (CIIR), which combines basic research with technology transfer to a variety of government and industry partners. He has published more than 180 articles related to information retrieval. Dr. Croft was elected a Fellow of ACM in 1997, received the Research Award from the American Society for Information Science and Technology in 2000, and received the Gerard Salton Award from the ACM Special Interest Group in Information Retrieval (SIGIR) in 2003. Donald Metzler is a Research Scientist in the Search and Computational Advertising group at Yahoo! Research in Santa Clara, CA. He obtained his Ph.D. from the University of Massachusetts in 2007. During his graduate studies he was awarded a Microsoft Live Labs Graduate Fellowship. His research interests include formal information retrieval models, web search, advertising, and machine learning. Trevor Strohman is a software engineer in the Google search quality division. His Ph.D., from the University of Massachusetts Amherst, focused on high-performance text retrieval systems that are easily adaptable to fit specific retrieval applications. He has published papers and presented a tutorial at the top information retrieval conference, SIGIR. He is the creator of the Galago search engine, and the primary developer of the Indri search engine (www.lemurproject.org/indri). He has ten years of professional software development experience, including desktop, server, and web applications.